Ideal for assistance dogs or dogs that have medical conditions, special needs or are in training. 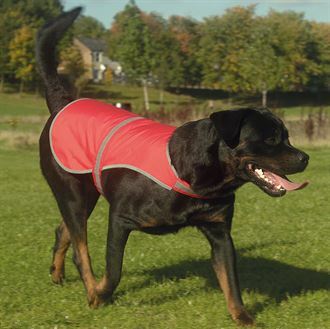 Ideal to keep your dog safe and visible all the time. Ideal for assistance dogs or dogs that have medical conditions, special needs or are in training. Strong tear and release velcro fastening under the neck and body. Maximum washing temperature 40ºC, wash as synthetics. No bleaching allowed. Do not iron. Do not tumble dry or wring. Do not dry clean, cold rinse and short spin. Do not wash in biological powder. See the Measuring Guide Tab Below to find the perfect fit. Let us print your dog’s name or message on the Hi Vis vest. Printing will be on both sides of the vest in white unless you state otherwise. *What colour would you like the Print to be?